Ready to run through an amazing path and get away with it? time to 'Try to Escape'! Make your way through the funniest path and keep the pace! Be careful! There will be many obstacles, twist & turns. Run wisely and do not hit any of them! The only thing that you have to do is to use arrow and space bars or your fingers to whip your way through this challenge! It is easy to play yet hard to master! 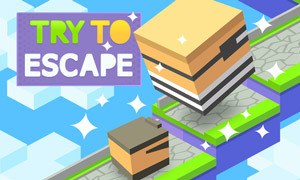 Jump, turn and slide through the most addictive and challenging path! Take care of your little hero not to fall, it depends on you! The only option you have is to run! And try to escape if you can! Compete with your friends and share the fun!